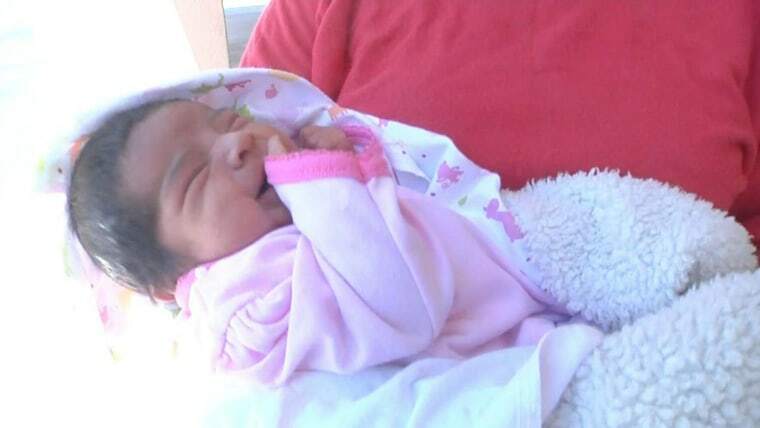 A mother wrapped her arms around her 12-day-old baby and held on as the passenger bus in which they were traveling rolled over in a crash Wednesday morning that killed four passengers in the desert near the California-Arizona border. Ana Perez said two passengers seated next to her were killed in the crash on the westbound 10 Freeway in Blythe, California, about 220 miles east of Los Angeles. Thirty-two people were on the bus, which was traveling from El Paso, Texas, to Los Angeles after it had stopped in Phoenix for a driver change. "It was really, really bad," said Perez. "It was horrible. I didn't let her go." Perez, who was breast-feeding her newborn, felt the jolt as the bus struck steel pipes that were scattered across the freeway during an earlier crash involving a flatbed truck. The bus ended up on its side about 50 feet off the freeway. "(The driver) was trying to avoid it, but it was too late," said Perez. "When I got up, I was in between two dead bodies. It was horrible." Perez and her daughter, Daniela, were helped from the bus by rescuers through an emergency exit in the roof. She could hear screams as she tried to find her way through a cloud of dust kicked up during the crash. Perez suffered bruises on her leg and back after slamming into a window when the bus rolled. Daniela (pictured, right) was not injured. "It was a miracle," Perez said, adding that the bus driver appear to do "everything he could" to avoid the pipes on the dark stretch of freeway. She was released from a hospital Wednesday morning and planned to continue on to Los Angeles. Thirty-two people were on the El Paso-Los Angeles Limousine Express bus, according to Caltrans officials. A preliminary investigation indicated the eastbound big rig jack-knifed and scattered a load of steel pipes on both sides of the freeway. A California Highway Patrol officer told the Associated Press that three passengers were airlifted and four others were transported in ambulances to hospitals. Fourteen others were transported by bus to a hospital for evaluation of minor injuries, according to the officer. The freeway was expected to remain closed into Wednesday afternoon.